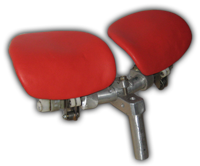 If necessary the bearing of the two seats can be adjusted. Also a sportive cyclist can use the saddle. No need for a low adjustment of the saddle!